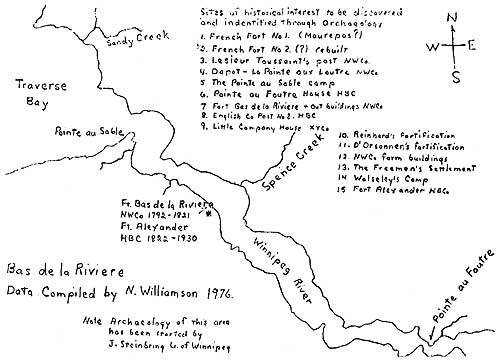 A geographical definition of the term Bas de la Riviere would be: that part of both shore lines of the Winnipeg River from the last discharge at Pointe au Foutre to the waters of Lake Winnipeg. Pointe au Foutre probably got its name because it was the last portage, or the first, on the river. Foutre was the perfect term for the voyageurs as it could be used both in landing or debarking the cargo as well as being an excellent term by which to express one's feelings about the Winnipeg River. In its simplest and most constant usage, Bas de la Riviere was the stopping place for anyone leaving or entering the Lake Winnipeg-Lake Superior or Albany River routes. Seldom did travellers of any kind not make a halt there to dry out goods or make repairs to their canoes or gear. Bas de la Riviere's prime function in the fur trade was as a supply depot for the brigades on the Superior route. This function began, to a lesser extent, during the French period and reached its peak during the height of the North West Company. The farm which developed at Bas de la Riviere supplemented the usual provisions of the trade. Primarily, the farm provided wheat flour and potatoes. However, it also provided barley, peas, vegetables and some meat and dairy products. At the time of the fur war, Bas de la Riviere was also the chief post of the North West Company in the Winnipeg River Basin. It was in this area, called the Winnipeg East District by the English Company, that the Hudson's Bay Company chose to concentrate its struggle against the Nor' Westers. During the Selkirk period of the war, both sides considered Bas de la Riviere to be a key to winning the struggle. Bas de la Riviere also functioned as the base for the Traverse Bay White fishery, the major contributor to the winter provisions for both the Winnipeg River basin and the lower Red River, including "the Forks." After 1821, Bas de la Riviere became a backwash in the Hudson's Bay Company Empire. The farm continued as did the White Fishery. However, as the district was exhausted, it was a minor post in the fur trade. It did function as a place to send unwanted "country wives" while the Hudson's Bay Company men thought of a "gentlemanly" way to dispose of them. As transportation from the east shifted from water to rail, the Bas de la Riviere post slipped further into oblivion as a minor Company store. Today the major portion of Bas de la Riviere is within the boundaries of the Fort Alexander Indian Reservation. The trade routes from Lake Winnipeg to the English on the Bay and the French in New France were first established by Indian middlemen like the Ottawa, the Cree and the Assiniboine. Using these routes the coureur de bois, or woodrunners as the English called them, preceded the official or licensed French trader into the interior. It is probable that the coureur de bois had their "wintering shacks," as the English called them, on the Winnipeg River, as they had them on the Albany long before the advent of the Postes du Nord. Therefore, the term "first" becomes problematic. The first recorded penetration west of Lake Superior occurred in 1684 with the arrival of Daniel Greyselon Du Lhut at Thunder Bay. By 1689, an associate Jacques de Noyon had reached inward to Lake of the Woods. Then in 1697, the English posts on Hudson Bay fell to the French and official interest in the western fur trade shifted to Hudson Bay. However, it is unlikely that the Superior route was abandoned; for when the English returned to the Bay after the Treaty of Utrecht in 1713, they immediately discovered that the woodrunners were in the interior. Three years later the coureur de bois were building wintering posts on the Albany route to cut off the trade (Morton n.d. p. 158). By 1719, the Indians had told Henry Kelsey that the French had a post on Rainy Lake (Morton n.d. p. 158). In 1727, La Verendrye took command of the Poste du Nord. Following his appointment there was a noticeable increase in the raids against Indian bands trading into Hudson Bay. These raids increased the volume of the Poste du Nord's trade in fur and slaves, particularly in slaves. Indeed, later in his career La Verendrye pointed out that the trade in slaves had been a major part of his contribution to the development of New France. However these raids were not welcomed by the bureaucrats of the Imperial French government who were his superiors. By 1732, there were Frenchmen active on Lake Winnipeg. On August 17 of this year McCliesh (Macklish) of the English Company informed London that there had been three canoes of woodrunners on the lake visiting the camping places on the Bay route. (Davies 1965 p. 168). Macklish (McCliesh) also reported a settlement on the southern-most end of Lake Winnipeg (Morton n.d. p. 158). However, there is no indication of the location of this "settlement." In his report to his superiors, La Verendrye has given the impression that his moves into the interior were the initial French thrust. It is probable that by that time the raids were a problem between himself and his superiors. By August 1732, Fort Charles had been built on the North West Angle on Lake of the Woods. The following year some time before May 21, La Verendrye sent one of his sons Jean Baptiste and La Jemeraye down the Winnipeg River to build a fort. From this point in history until 1750, it is not clear if there is an official French establishment at Bas de la Riviere. This is due in part to the manner in which La Verendrye wrote up his report. They appear to have been deliberately vague in the matter of details unless those details show La Verendrye in a very favourable light. Considering the condition of his appointment, one cannot fault the man; for he was not writing for historians. Apparently when establishments he had named after his superiors failed, he may have shifted the name geographically (He had a great deal of trouble with Maurepas both the man and the fort). Hopefully historical archeology will fill the gaps. Ice in the river halted the Winnipeg River expedition and Jemeraye turned back. It is not recorded if Jean Baptiste continued to Bas de la Riviere or not. M. Champagne believes he remained where the ice stopped him, according to Champagne at La Barriere, and built a fort. (Champagne. Man. Hist. Soc. Ser. III No. 25 p. 8). This would place the fort near Portage d'l'Ile at the mouth of the English River. There is a great deal of confusion about the "old French fort" in this area. On May 26, 1737, there begins a series of events which add to the confusion. On this day sixty "Barrier Cree" arrived at St. Charles and informed La Verendrye that all the "Winnipeg Cree" he had left at Ft. Maurepas (on the Red [Burpee 1927 p. 191]), have died of the pox (Burpee 1927 p. 256). Then on the 28th, La Verendrye's son arrived from Lake Winnipeg (Burpee 1927 p. 258). From what the son stated about the furs in the rapids, it appears he had arrived via the Winnipeg River. The question these events bring up is, where was the son coming from on Lake Winnipeg? It is not Maurepas on the Red; so he was either travelling as a coureur de bois or coming from an establishment on the Lake. Because of the great gaps in the La Verendrye records, history jumps to 1739. In April of this year, Lamarque who had been running Fort Maurepas on the Red as a trading post, abandoned it and moved to the Winnipeg River (Burpee 1927 p. 358). However, there is no record as to where he located nor if the establishment had a name. 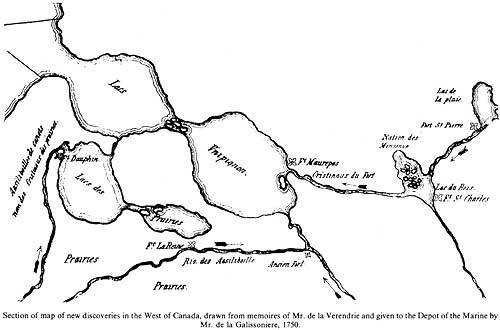 Ten years later in an abridged memorandum respecting maps representing the establishments of La Verendrye, the location of Fort Maurepas was given as being on the north side of the river of the same name where it flows into Lake Winnipeg. This would place it at Bas de la Riviere. However, given the inaccuracy of the maps of the period, it should not be taken as absolute proof. Further to Fort Maurepas, Beauharnois reported to Maurepas that it had been abandoned for lack of supplies (Burpee 1927 p. 396). It may have been re-established during the 1742-43 season. Sometime between 1747 and 1750 Pierre La Verendrye, the son, rebuilt a Fort Maurepas which had been burnt. It is only in 1750 when Jacques le Gardeur sieur de Saint Pierre took command of the Poste du Nord that an establishment definitely is recorded at Bas de la Riviere. He stated in 1751 "... what annoyed me, but rather the want of provisions, which were usually found at the different posts which I visited, that is, at the fort in the lake of the woods, and at the lower part of the Winnipeg River." (Report of Can. Archives 1886 p. CLIX). In the following year, Saint Pierre was at "Bas de la Riviere 8nipik." However, the name Fort Maurepas was not used nor does the name appear in the Bougainville list of Military Posts in the North West for 1759. (Davidson 1967 p. 32-33). In 1759, the French were defeated at Quebec and in 1760, the Postes du Nord were ceded to the English. This ends official French occupancy of the North West. However, many coureur du bois remained in the interior where they continued to trade as independents until some joined the companies which in time formed the great company, the North West Company. The ceding of the Postes du Nord by the Imperial French Government in 1760 opened the way for the westward expansion of the New England traders. The English at the Bay called these traders the pedlars. By the 1761-62, the New Englanders had reached Michilamacinac. In the meantime at least three traders from the French period were still in the North West. They were Francois Le Blanc, Louis Primo and Apoes. Of the three, Le Blanc, also called Franceway, Le Blancell or Saswe, appears to have been the longest in the trade. He had been thirty years in the trade when the pedlars reached the west (Williams 1969 p. 262n.). The Indians at Rainy Lake effectively halted the movement into the interior until the 1767-68 season by plundering the pedlars. In 67-68 the pedlars passed by giving "presents." The problem was solved when the "Nadewessies" destroyed the Indians at Rainy Lake (Quaife 1921, p. 232). It was during the 1767-68 season that Andrew Graham of the English Company sent his servant William Tomison into the interior from Severn House (Williams 1969 p. 262). Tomison reached Bas de la Riviere on September 3 and discovered it was a meeting place for the Indians and the French traders. He found Le Blanc trading there and Franceway's standard of trade was thirty loads of powder for one beaver, eight strings of beads for one beaver and one and a half feet of tobacco for one beaver. (Williams 1969 p. 275n). In 1775, when Alexander Henry the elder traded at Bas de la Riviere there was a large village of Crees there (Quaife 1921 p. 239). Over the years, there was a gradual movement toward more organization among the pedlars; also more of them were working out of Montreal. By 1779-80, the following Companies were trading into the North West: Todd, Frobisher, Paterson & Co.; McBeath, McTavish, Bannerman & Co.; John Ross & Co.; Venance, St. Germaine & Co.; and Porteous and Sutherland. The next season an initial attempt at a cartel was attempted; but it failed. By then, the volume of trade goods exceeded 2,520 gallons rum, 180 gallons wine, 180 firearms, and 44 hundred weight of ball and shot. The growing numbers of men and canoes passing through Bas de la Riviere brought to a head the problem of provisions. The lack of an adequate food supply for the voyageurs had become a major deterrent to the growing trade. Finally economic necessity brought about a five year agreement among many of the companies. 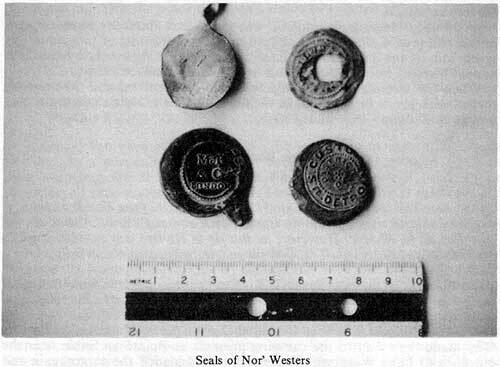 This organization became known as the North West Company. With the advent of efficient organization, Bas de la Riviere became the interior supply depot for the Nor' Westers. The depot was established at Pointe aux Lautre (Otter Point). The pemmican supply for the depot was to come from the Company establishments on the Red and Assiniboine Rivers. In 1787, Simon Fraser of St. Anne's and Lesieur Toussaint were partners. Independents, they contracted with the Nor' Westers to handle the posts at Riviere des Trembles and Portage d'l'Isle (Angus Shaw to Roderick McKenzie Dec. 16, 1789). Then in 1791, the two partners signed a five year contract with the Nor' Westers (Wallace 1954 p. 51). During the 91-92 season Lesieur was forced to leave the interior for his health. However, he returned for the 1792-93 season and built a post at Bas de la Riviere. In 1794, John McDonnell called this establishment "Sieurs fort" (Masson 1960 p. 291). In due time, a new depot was built to replace the old one at La Pointe aux Lautre (Coues 1965 p. 34). Its location at Bas de la Riviere is open to question. 1793 was an important year in the growing struggle for the trade; for it was the year the English moving inland from Albany, Henley House 1766, Gloucester House 1777, Osnaburgh House 1786, and Etchabitchewan 1792 established a post on the Nor' Westers route at Portage d'l'Ile. With the arrival of the English the competition grew tense. On October 1 1795, Edward Clouston of the English Company arrived at Bas de la Riviere to establish a post. He chose to build at Pointe au Foutre and the post is called Pointe au Foutre House. (HBCA B4a 1795). Clouston recorded the servants as this post as David Michael, Peter Taylor, George Groat, Samuel Harvey, John Short, Thomas Firth, George Spence, John Mowat, Magnus Sinclair and an Indian David Sanders. In 1796, Clouston was attacked by a hostile Indian and he ordered a pallisade built. As the tension continued both he and his successor ordered a watch kept. During the 1798-99 season, the English Company apparently shifted their establishment at Bas de la Riviere to a location near the Nor' Westers post. They also tried to establish a supply depot. (Rich 1960 Vol. II p. 182-83). By 1800, the North West Company is reaching its peak. Its trade in furs for the year was worth £144,300 (HBCo. £38,463). On May 15th 1800, four men of "the Little Company" (Alexander McKenzie's breakaway XY company formed 1798-99 rejoined Nor' Westers 1803) arrived at Bas de la Riviere to build an establishment (HBCA B4a, 1800). Because of the difficulty of provisions they left before winter set in. Soon the English Company also abandoned its Bas de la Riviere establishment. In February of 1811, the Selkirk land usage proposal was put before the shareholders of the Hudson's Bay Company. On June 12 the grant was made. The Nor' Westers establishment at Bas de la Riviere was on the land granted to Selkirk. As the Selkirk period is so important in the history of Bas de la Riviere it is treated separately. The struggle with Selkirk-HBCo along with a faulty financial system drained the resources of the North West Company. Many of the wintering partners had become discontent with the financing of the Company as early as 1800. This added to the political pressure brought to bear by Edward Ellis of Inglis, Ellice, and Co. Suppliers to the North West Company (Wallace 1934 pp. 26-36) brought the greatest fur company in the history of North America to an end. Thus, in 1821, the smaller, less successful English Company absorbed the giant and Simon McGillivray had to stomach the dictates of Nicholas Garry. The abandonment of the Fort William for the, all English, Hudson Bay route meant the end of Bas de la Riviere as a major link in the fur trade. It also meant depression in Montreal and depression and unemployment in the North West. It was the time when the ranks of the "free men" grew and the time the spark that became the "New Nation" appeared. We know from Laidlaw's report of 1817 that the Nor' Westers' farm contained crops of wheat, barley, peas, oats, and potatoes. By 1821, the stock consists of hogs, horses and cattle. The hay for the stock was meadow hay cut and cocked by the men and women in early August. The garden produced pumpkins, carrots, turnips, and onions lifted by the end of September. A great deal of potatoes were produced. In 1822, the new tenants left 815 kegs, a keg being an approximate seventy pound measure. In September the roof thatching was replaced with fresh marsh grass. September was also the month for buying wild rice. When the water levels were right this crop was a staple. However as it was easily destroyed by high or low water it was unstable. A crop failure is recorded as early as 1735. As the big game had been long exhausted in the region fresh meat was not a staple at Bas de la Riviere. One must also remember that the pemmican was used for the brigades. Therefore, the winter staple was the white fish; all else was supplementary. The white fish spawn in October on the sand and gravel bottom of Traverse Bay. Other fish also gather to feed on the roe. Taken in nets, the white fish were pierced with the point of a knife about two inches above the tail and strung ten at a time on a willow stick. These sticks of fish were then racked in the shade. The slime dripped off and they kept well as long as the weather kept cool until they froze (Masson 1960 p. 298). As soon as there was enough snow the men began to cut wood and haul it in on sleds. It was critical that this supply be secured early because they might weaken in January if the diet became poor. Some years a good supply of snared rabbits added fresh protein to the diet of fish. January, February and March were the starvation months at Bas de la Riviere. In a particularly bad year it could begin in December. The area was notorious for it lacked a stable, immediate source of food. In La Verendrye's time it slowed expansion (Morton 1957 p. 25). It made the XY Co. abandon its post in 1800 (HBCA B4a 1800) and drove Thomas Vincent of the HBCo to call Bas de la Riviere "this accursed miserable place" (HBCA B4a 1800). A typical cause of starvation was the loss of the white fish catch to warm weather in November of 1799. By January of 1800 the English Company servants were starving. In desperation, Vincent asked Red River for help. However, the buffalo were out on the plains because of the mild weather and everyone, as far west as Brandon House, was short of food. During such times the journals were preoccupied with the obtaining of food. Some of the entries are painful in their simplicity: three fish from four nets, one fish, country provisions finished only flour, very desperate here. (HBCA B4a 1797-99). It was the spring spawning run of the pike (Jackfish) in Catfish Creek that broke the hold of starvation at Bas de la Riviere. By the time the sturgeon appeared in May, food was usually plentiful again. With the arrival of spring the Nor' Westers planted their crops and gardens and prepared the depot for the Pemmican brigades from the Red and Assiniboine. In 1808, Alexander Henry was master of the Red River brigade. He had built a large boat to carry the pemmican. He left his post on June 1 with the long boat: 282 bags pem., 1 bag potatoes, 42 kegs grease and 1 cow. (bags = 90 Ibs Kegs 70 lbs and a cow averages 400 lbs meat). Not including fur, men, women, gear and the potatoes the long boat carried 30,000 lbs buffalo provisions. In the brigade were also one Lake Winnipeg canoe: 21 bags pem., 1 bag potatoes, 3 kegs grease and one buffalo. A canoe: 9 Taureaux (bag), 3 kegs grease, 2 bags potatoes, 2 buffalo and 4 bales meat. A third canoe 22 kegs grease, 1 bag potatoes, 1 buffalo, 10 bags potatoes. A small canoe: 10 kegs grease, 1 bag potatoes, 1 cow. He was also carrying 42 kegs of sugar (Maple) (Coues 1965 pp. 441-46). With the arrival of the pemmican brigades like Henry's the depot was ready for the major fur brigades from Athabaska and the Saskatchewan. On June 1, 1804, Alexander Henry described in his diary the sight of two brigades coming into Bas de la Riviere "Early our brigades arrived. The 18 crafts abreast, all singing and keeping time with their paddles and oars; the canoes being heavy loaded and having only three men apiece, made it easy to keep in chorus with the boats." (Coues 1965 p. 246). Like all the other wintering partners, the master of the post at Bas de la Riviere went down to the summer meeting with the Montreal partners or their agents at Grand Portage and later Fort William. It was then that the annual meeting of the North West Company was held. At least twice the fate of the Bas de la Riviere establishment went before the meeting, in 1808 as a trading post and in 1813 as a depot. During the 1808 meeting, the lack of returns from the Lac Ouinipique department was discussed and the number of posts was cut by half. Skabitchewine, River Casse, Riviere au toute, Les Dalles, and Bas de la Riviere remained. In the 1813 meeting a complaint was raised first about the waste of pemmican and grease; and second about the poor accounting of the provisions given out to the brigades (Wallace 1934 p. 276). However, by the next annual meeting both problems had been solved (Wallace 1934 p. 289). When the meeting was over the furs left for Montreal and the brigades loaded with goods began to make their way inward to start a new season for Bas de la Riviere. Note: The sources for this study are the records of the Nor' Westers and the journals of the Hudson's Bay Company establishment at Bas de la Riviere. However, as Bas de la Riviere was primarily a bastion of the North West Company, it is their season that it follows. For the Nor' Westers at Bas de la Riviere, the season began with the arrival of the inward bound brigades from Grand Portage, and later Fort William, for the establishment was first and foremost a provision depot. When the canoes had been loaded at the last portage at Point au Foutre, they made their way to the camping grounds at Pointe au Sable near the entrance to Lake Winnipeg. There the men unloaded the cargo again and checked it for wetness, the great hazard of the white water of the river. Soon trees and bushes were festooned with the long ribbons of opened bales of dry goods, their bright colors flashing in the wind and sunlight. These goods had come a long way to reach Pointe au Sable. They had been ordered from England in October two years before by a Montreal agent. Then they were shipped the following March, reaching Montreal during the summer. That winter the goods are repacked into the ninety pound pieces carried by the voyageurs. In May of the next spring, they left Montreal to be put ashore at Pointe au Sable in August. Sent on to the posts they were traded for furs which came back through Bas de la Riviere. The next summer, a year later, they were in the auction rooms of London (McKenzie 1903 p. 1). While some of the men looked to the Cales, others repaired the canoes. Next they saw to the provisions they needed for the rest of their trip. The staple was pemmican. It was stored at the depot in ninety pound buffalo skin bags called tauraux or bulls. All canoes bound for the Cumberland House route got an initial four tauraux. Of these the canoes in the Athabaska brigades got three or four more tauraux depending how far into the McKenzie Valley they were going. The Saskatchewan brigade canoes got two additional bags to take them as far as the elbow where it was expected they would find the buffalo (Coues 1965 p. 539). The Assiniboine and Red River brigades were given much less as it was expected they would find the buffalo shortly after leaving the forks. Pointe au Sable was also a place to rest, a place of reflection or a boisson for there was seldom a season passed that men did not drown somewhere between Rat Portage and Pointe au Foutre. In the master's house, wintering partners met for the last time over brandy and tobacco for some would not see each other for a year. When the last of the brigades had passed, the depot still had to provision the express canoes, those fast light canoes that travelled the continent carrying packets from Montreal to the Pacific and back. With the inward brigades had come the trade goods for the post at Bas de la Riviere. In 1797, Charles Chabaillez, the master of the Red River brigade brought in pieces marked Q for the post. They consisted of one case of guns, eight kegs of high wine, and four rolls of Spencer twist tobacco (Payette 1964 p. 143). Of course, the Nor' Wester store at Bas de la Riviere held other trade goods. In 1800, the Hudson Bay servant Thomas Vincent complained that the Nor' Westers had steel traps, wampum beads, colored worsted, silver trinkets, and hair pipes all of which he did not have (HBCA B4a 1800). Then there were the standard powder, shot, axes, knives, files, steels, gun flints, copper kettles and Rum. When the goods have been stored away on the store shelves the preparations for winter began. The key to survival was good housing, fuel and an adequate food supply. The dimensions of the Nor' Westers' houses at Bas de la Riviere are still unknown. However the HBCo house built in 1794 was thirty-six by eighteen feet and constructed of locally cut logs. The flooring was hewn planking. The chimney built by Thomas Firth was made of stone. (Flat limestone was available on the north shore of Bas de la Riviere). The shelving was sawn by the men. (HBCA B4a 1795-96). The roof of the building was wild grass thatching. Other buildings were often roofed with birch rind. With the advent of the fall there was the harvesting of the crops to take care of. In late August and early September the grain was cut and tied into sheaves. The sheaves were then stored in the barns to keep them dry. Threshing was done on the threshing floor using a flail. There was a mill for grinding flour. Editor's Note: Continued in Winter 1978 issue. Arthur, G. The Letters of Lord and Lady Wolseler 1870-1911, 1922. Burpee, L. J. (Ed.) Journals and Letters of Pierre Gaultier de Varennes de la Verendrye and his sons, 1927. Butler, W. F. The Great Lone Land, nd. Coues, E. (Ed.) New Light on the Early History of the Greater North West, 1965. Davidson, G.C. The North West Company, 1967. Davies, G. F. K. Letter from Hudson Bay 1703-40, 1965. Halkett, J. Statement Respecting the Earl of Selkirk's Settlement etc., 1817. Huyshe, G. L. The Red River Expedition, 1871. H.B.C.A. - B4A. Being the HBCo. Journals of establishments at Bas de la Riviere. Mackenzie, Alexander. Voyages from Montreal through the Continent of North America to the Frozen Sea and Pacific in 1789-1793, 1903. Masson, L. R. Les Bourgeois de la Compagnie des Nord-Ouest, 1960. Morton, A. S. A History of the Canadian West to 1870-71, nd. Morton, A. S. Sir George Simpson, 1944. Morton, W. L. Manitoba: A History, 1957. P.A.C. The Selkirk Papers. MG. 19, El. Payette, B.C. The North West, 1964. Preston, W. T. R. The Life and Times of Lord Strathcona, nd. Quaif, M. M. (Ed.) Alexander Henry's Travels and Adventures in the years 1760-1776, 1921. Rich, E. E. (Ed.) Journal of occurrences in the Athabaska department by George Simpson 1820 and 1821, 1938. Rich, E. E. Hudson Bay Company 1670-1870 (3 vol.) 1960. Tache, A. A. Sketch of the North West, 1870. Wallace, W. S. Documents Relating to the North West Company, 1934. Wallace, W. S. The Pedlars from Quebec, 1954. Williams, G. (Ed.) Andrew Graham's Observations on Hudson Bay 1767-91, 1969.